Steampunk adventure with an environmental point. After a daring chase across the globe, Tim Barnabas and Clara Calland have brought Clara's scientist father's secret formula to Westralia. Here, much of Australia is simply too hot to be habitable by day. Duke Malcolm, of the Imperial Security Service, transports Claras rebel-father to a prison in Eastern Australia, hoping to bait her into attempting a rescue. Clara looks to Tim for help, only to find he has fled a racist incident into the desert. She takes a burrowing machine know as a "steam mole" in search of him. The two head to Eastern Australia, where they discover an invading force with plans to take Westralia. Dave Freer's Cuttlefish laid the perfect foundation to Clara and Tim's story, from their blooming friendship to their dangerous adventure. After many days dodging Duke Malcolm's army, Clara and the other residents of the Cuttlefish have finally made it to the Republic of Westralia. Their journey begins anew in The Steam Mole as they adapt to life on land and all the trials that follow. What I love about Cuttlefish and The Steam Mole is how consistent Freer remains with the steampunk and science-fiction elements. 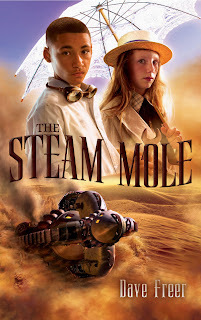 Clara is no longer confined to an illegal, coal powered submarine, but Freer easily introduces another intricate, and quite important, machine: the steam mole. The steam mole is a central part of the novel that intrigued me because it took the biggest scenes of adventure underground. It's like exploring a whole new world with the same suspenseful aura and complex storyline. Freer extends our view of Clara's world. With her mother's sudden illness, and the fragile hope that her father is imprisoned nearby, the story's plots and subplots diverge. New characters are thrown into the growing pile of perspectives like Lampy, the young aboriginal with a dark past and bright future. Lampy reminded me of Tim because of their similar backgrounds and temperaments; both know how to survive in the most unlikeliest situations and both are the victims of prejudice based on the color of their skin. This aspect brings a certain cultural awareness that is highly overlooked in young adult literature. That it's found in a steampunk, sci-fi novel is even more of a draw. While I did enjoy The Steam Mole and it's perfectly pieced together conclusion, I have to say that it wasn't quite the sequel to Cuttlefish that I'd been expecting. By the end of the story I got the impression that the characters were settling in their new lives, not gearing up for a possible future adventure. When the subplots finally converged and the wrongs set right, the outcome felt as though forced. Freer made it too easy and not as nerve-wrecking as the explosive conclusion of Cuttlefish. I really love Clara and Tim, their ability to tough it out is awesome, I'm hoping to find their story continue in another novel. Hopefully, one with just as much action and alternate history!